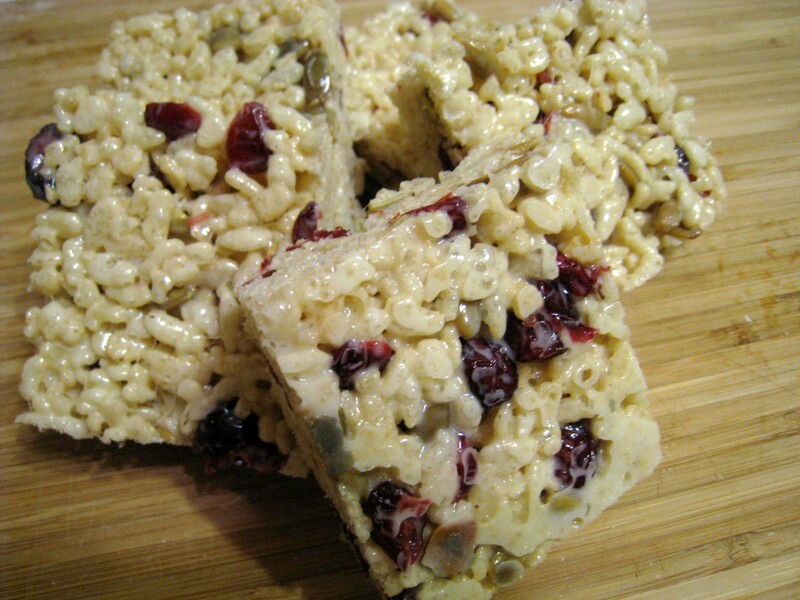 These are a twist on the traditional Rice Krispie treats. They’d be great for bake sales and part of holiday gift baskets. The cranberries add a little tartness and they are chewy. The pumpkin seeds add a little crunch and I definitely will be adding more in the next batch I make. Heat a large nonstick skillet over medium high heat. Coat pan with cooking spray. Add pumpkin seeds, cook 4 minutes or until seeds begin to pop and lightly brown, stirring frequently. Remove from heat and cool. Lightly coat a 13 x 9 inch baking dish with cooking spray and set aside. Melt butter in a large saucepan over medium heat. Stir in marshmellows, cook 2 minutes or until smooth stirring constantly. Remove from heat and stir in vanilla and salt. Stir in seeds, cranberries and cereal. Scrape mixture into prepared dish using a rubber spatula. Press cereal mixture evently into the prepared dish. Cool completely and then cut into 16 bars.